Tired of plugging in Ethernet to update your computer password? 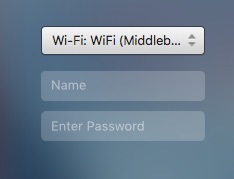 Want to log into a Mac for the first time, but don’t have Ethernet handy? Middlebury College loaner laptops and Windows 7 laptops have been able to log into the MiddleburyCollege wireless network at the login screen for months. You will soon be able to do the same from your college-owned Macintosh. Watch for changes to your login screen, as pictured below. If you have any questions, please contact the helpdesk at X2200 or create a Helpdesk ticket. This entry was posted in Midd Blogosphere and tagged ITS, LIS Staff Interest on November 7, 2016 by Nathan Burt. A vulnerability in the Adobe Flash Player software installed on many computers on campus has the potential of allowing a computer to be taken over via an email read (or even previewed) by Outlook. Information Technology Services typically does not interrupt you for software installations and patching, but the severity of this issue requires immediate action. ITS will be automatically patching Adobe Flash Player on college computers that have outdated versions installed. If you are logged into an affected computer, you may see a Dell KACE pop-up window in the lower right corner of your screen indicating the update is being applied. There are also updates to Office released December 8th by Microsoft to address this vulnerability. These updates should already have been installed automatically as part of Microsoft Updates. ITS will check the status of these patches. This will slow your computer down for about 15 minutes, and you will see a KACE pop-up if your machine is being patched. This is a good reminder that we are empowered to maintain software on computers that are assigned specifically to us. Please install all Microsoft, Adobe (and Apple, if you are using a Mac, or Apple software on Windows) patches to keep your computer safe. While there are occasionally problems introduced by patching, their impact is unlikely to be as severe as a virus infection, or the like. Please contact the helpdesk if you have any questions or concerns about this update. 802-443-2200, helpdesk@middlebury.edu, or create a ticket at http://go.middlebury.edu/whd (providing us with the “Property of Middlebury College” number of the computer). This entry was posted in Midd Blogosphere and tagged LIS Staff Interest, Middlebury Community Interest on December 18, 2015 by Nathan Burt. Almost all public machines recently received an update from Internet Explorer version 8 to version 9. Shortcuts, favorites, plugins and the like have been unaffected in all of our testing beforehand. If you encounter problems or have questions, please pass them on. *Last year INB was approved to run on Internet Explorer 9, and the group policy that blocks IE9 was removed. As we noticed that computers still were not receiving IE 9 as an update, we found we had a registry entry to modify to undo the group policy block that had been applied. As of that time, anyone running Microsoft Update should receive the IE9 update. Our computer labs do not run the regular Microsoft Updates, though, since most users do not have administrative privileges on those computers. Dell KACE applies critical Microsoft Updates on a regular basis – but IE9 is no longer in that update list (as it has been replaced by IE10 & IE11). So, a manual installation has also been set up for this purpose. This entry was posted in Midd Blogosphere and tagged LIS Staff Interest, lisblog on April 2, 2014 by Nathan Burt. GOT A PAPER DUE IN 10 MINUTES? This entry was posted in Midd Blogosphere and tagged LIS Staff Interest, Middlebury Community Interest on March 21, 2013 by Nathan Burt. Middfiles update – back online! If you are using a Windows machine, please restart your machine to make sure you have a new connection. If you are using a Mac, you must change the connection to the following AFP type connection – this is very important and will help ensure that we do not have file corruption in the future and that your Mac will be compatible with Middfiles. This entry was posted in Midd Blogosphere and tagged Helpdesk Alert, LIS Staff Interest on April 8, 2012 by Nathan Burt. We’ve discovered the root cause of all the middfiles problems! To fully correct the issues we must take the system offline for an elongated period of time which will begin this evening at 6pm. We anticipate the system will be back up for use around noon on Sunday. We will send a message out to the community letting you know all services have been restored. If you need to work on something during the weekend, please save a copy of the file to your computer or another drive device before 6pm this evening. This entry was posted in Midd Blogosphere and tagged Helpdesk Alert, LIS Staff Interest on April 6, 2012 by Nathan Burt. There is a class action lawsuit on behalf of owners of Macintosh computers that use MagSafe power adapters. If you own such a computer but have not received a notice about the lawsuit, find more information at https://www.adaptersettlement.com/. Have questions? Contact your computer vendor. Or the helpdesk (especially for college-owned equipment). This entry was posted in Midd Blogosphere and tagged LIS Staff Interest, Middlebury Community Interest on November 11, 2011 by Nathan Burt.